Beat This Caption Contest 117 Winner – Caption Contest Funny Clever Witty Enter Today! Can somebody get this Geezer outta my ear? 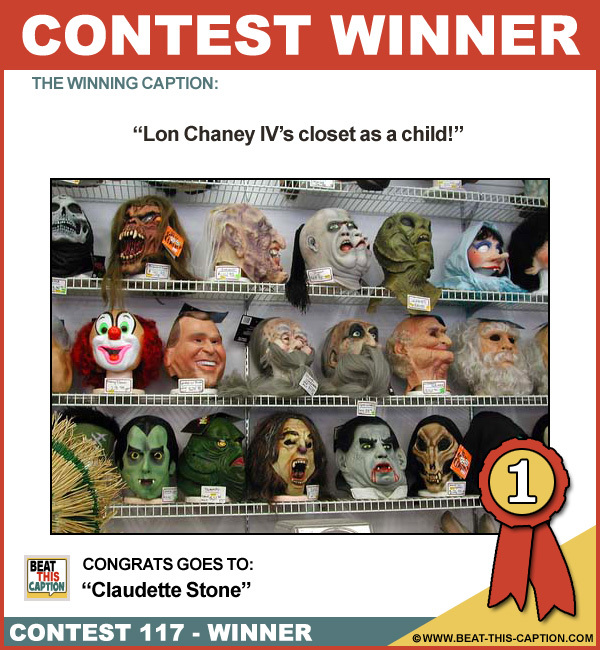 Lon Chaney IV’s closet as a child! Love the Caption! Anybody growing up on those old scary movies know they rock! Nice going! :) You WIN! Wait…..middle shelf–2nd from the left. THAT’S my uncle Bob! If you’re looking for a real scary mask, the Rosie O’Donnel’s are upstairs! “So, which face am I going to put on today?” thought Joan Rivers! What happened, I thought you were going to continue with the stamp collecting, Jeffrey Dahmer? The one on the bottom that’s ready to bite must be Obama! Michael Jackson’s plastic surgeon decides to declutter on Ebay!